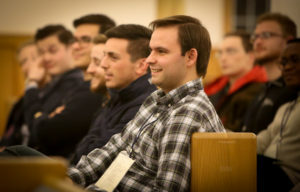 I have spent much of this past week in Rome for meetings with the Holy Father, but before I left, I was very happy to attend our annual vocation discernment retreats for men considering a vocation to the priesthood. 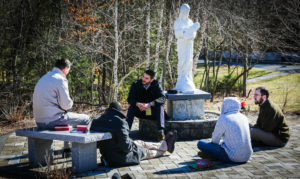 As in years past, there were two different “tracks,” if you will — one at the Marian Center in Medway for men who would be candidates for St. John’s Seminary and another for men over 40 who would be candidates for Pope St. John XXIII National Seminary, which was held at the seminary itself. 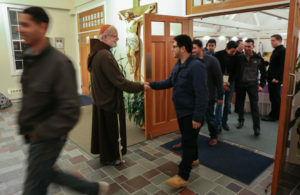 In all, we had 62 men participate with us — 12 at Pope John seminary and 50 at the Marian Center. 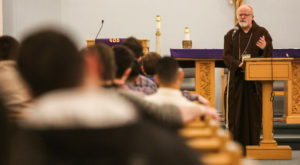 At both locations, the men had a chance to hear a number of witness talks and conferences given by seminarians. 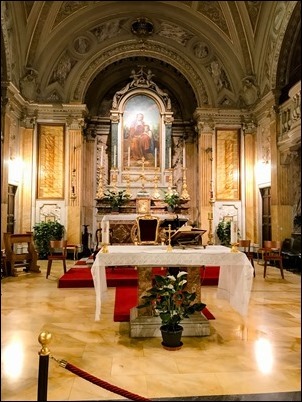 I also celebrated Mass and gave talks at both retreats. I was delighted to meet a number of the men personally and to hear their stories. We are very pleased that so many men are open to considering a vocation and were able to be with us. 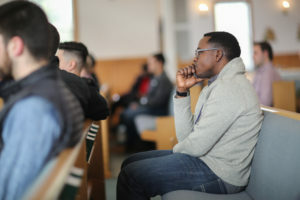 We are very grateful to the pastors and campus ministers who helped identify potential retreatants so we could invite them. We are also very grateful to Father Daniel Hennessey and all of those at Vocations Office who worked so hard to make the retreats a success. We pray that many vocations will blossom as a result of this experience. Also this week, I joined the bishops of the four dioceses of Massachusetts in issuing a letter to the Joint Conference Committee considering a proposal for criminal justice reform on Beacon Hill. We feel these reforms stand to benefit many individuals and society as a whole, and we hope this legislation will be given careful consideration and ultimately be enacted. 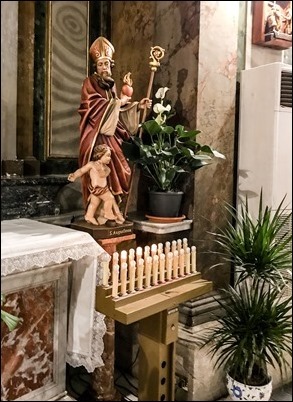 These proposed reforms are certainly in accordance with Catholic social teachings and stand to bring a great deal of help and relief to many individuals. We are pleased to learn that comprehensive criminal justice reform remains a top priority of Governor Baker along with the leadership of the House and Senate this legislative session. As members of the Joint Conference Committee tasked with addressing these complex issues, your responsibility cannot be overstated. That responsibility however presents you with the opportunity to craft legislation that will revolutionize how the legal system deals with certain types of criminal offenses. The legislation has the potential to benefit society as a whole and be life changing to many individuals and families throughout this great Commonwealth. Issues such as eliminating certain mandatory minimum sentences, creating rehabilitation and reentry programs, providing service to those suffering from mental health struggles must be at the forefront of your discussions. We, the four Roman Catholic Bishops of Massachusetts, representing the Archdiocese of Boston along with the Dioceses of Fall River, Springfield, and Worcester fully support your work and urge you, and ultimately the full legislative body, to join together in the effort to pass this historic legislation. While the specific details of the reforms are best left for the Committee to craft, debate, and resolve, we want to take this opportunity to reaffirm and restate our previous public support for the criminal justice reform legislation for certain offenses. (1) Repeal the excessively long mandatory minimum jail sentences for non-violent drug convictions by empowering judges to hand down a sentence for offenders on a case by case basis and determined by the specific facts and circumstances of each case. (2) Promote, create and fund diversion to treatment programs rather than imprisonment for offenders suffering from substance abuse. This is particularly critical as we face the deadly and growing opioid abuse crises in Massachusetts. (3) Increase funding for both in-prison programs for drug abuse and mental health services, education and job training as well as reentry programs for job training, placement, drug treatment, mental health services and housing. (4) Reform the Criminal Offender Record Information (CORI) system by reducing the period of time potential employers have access to an individual’s criminal records. The current system is designed to provide “roadblocks” to successful rehabilitation, employment opportunities and assimilation back into society by individuals attempting to turn their lives around. (5) Raise the threshold for felony larceny from its current level of $250.00 to a higher amount while retaining the ability to prosecute, fine, and imprison for misdemeanors under the higher threshold. When the circumstances of a criminal case dictate that an individual deserves a second chance he/she should get that chance. Families need to be united, not separated by bars. Rehabilitation services should be provided, not shunned. We urge you to continue the good work you are doing which ultimately will give more people more hope for a brighter future. 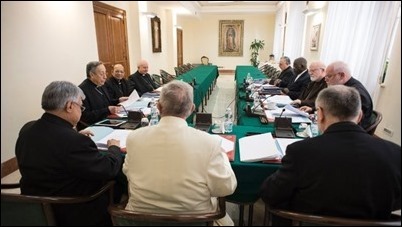 As I mentioned, after visiting the vocations retreats I left for Rome for one of our regular meetings of the C9 Council of Cardinals. 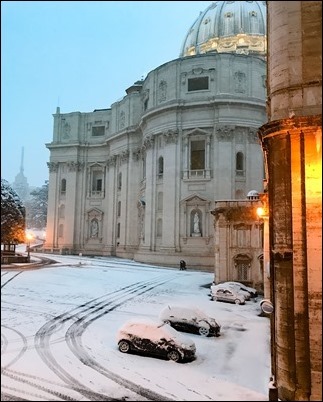 Thankfully, I arrived just before the Monday snowstorm in Rome, which caused much of the city, including the airports, to be shut down. For some, it was a major inconvenience, but for many, there was a real sense of giddiness as they go to enjoy a rare Roman snow day. 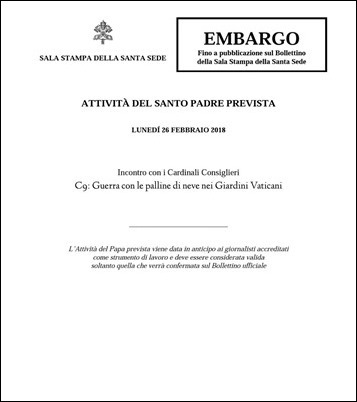 I got a real kick out of this “Bulletin of the Holy See Press Office” that was sent to me by someone who works with the media here in Rome announcing a snowball fight between the Holy Father and the members of the C9 in the Vatican Gardens. Of course, it was only a joke, which is probably for the best, since I’m sure it wouldn’t have worked out very well for us cardinals because the Holy Father would certainly have the whole Swiss Guard on his side! Of course, the snow didn’t last long and, in any event, our meetings carried on as scheduled. 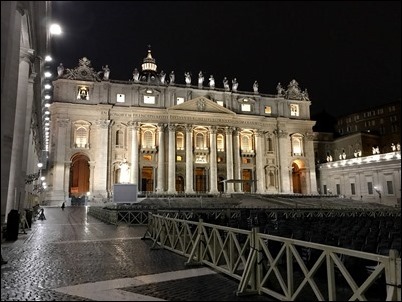 This time, we discussed the theological statute of episcopal conferences in light of the Holy Father’s call to avoid excessive centralization. We also heard a presentation from Archbishop Jan Romeo Pawlowski on progress made by the recently created Third Section of the Secretariat of State, which was established for the formation of diplomatic staff. 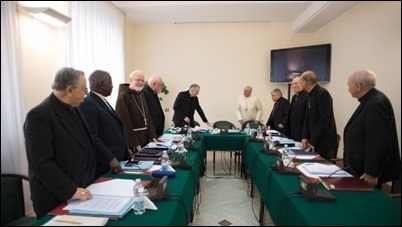 We also talked about the various options for the Congregation for the Doctrine of the Faith to process cases of child abuse more expeditiously and heard from the Prefect of the Dicastery for Promoting Integral Human Development, Cardinal Turkson, regarding the progress of the dicastery. 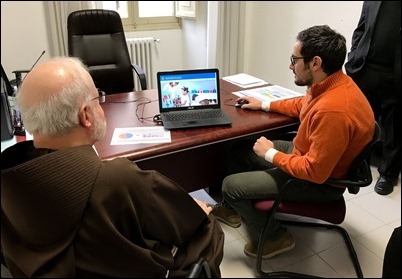 I was also very pleased to see the progress on the new website of the Pontifical Commission for the Protection of Minors. 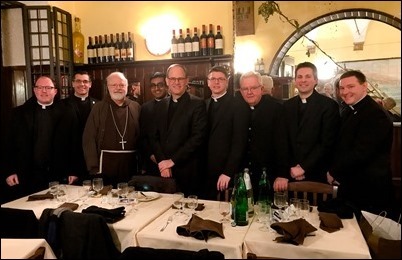 As I always like to do during my time in Rome, I invited all our Boston priests and seminarians there out for a dinner. Usually, this group is mostly of seminarians. 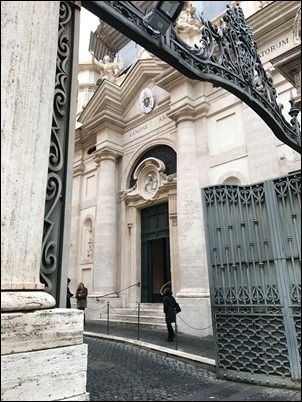 However, we have a number of priests also studying in Rome at this time including Father Andreas Davison, Father Tom Macdonald, and Father Michael Zimmerman, though Father Michael was not able to be with us because he’s in the Holy Land right now. 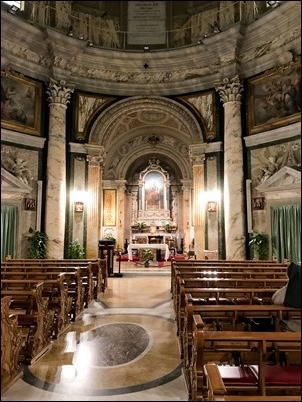 During my visit, I also had a chance to stop in at the Church of Sant’Anna, which is the parish church of Vatican City, located just off the Borgo Pio. 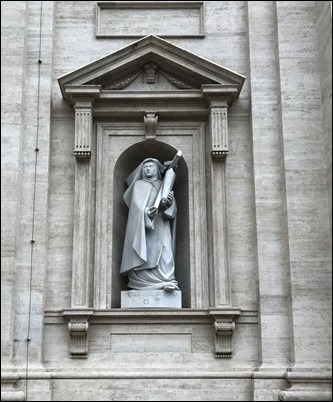 I was also very interested to see the statue of St. Edith Stein which was recently installed in one of the new niches outside St. Peter’s Basilica. Finally, I want to share with all of you this picture, which I recently received from my good friend Father Emilio Biosca, who is a capuchin working as a missionary in Cuba. I’ve known Father Emilio since he was a young man in Washington D.C. and I ordained him to the priesthood. He was a missionary in Papua New Guinea for 10 years and then went on to work in Cuba. It’s always a joy to hear about his progress there. 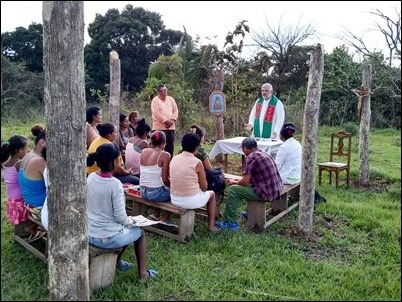 As is often the case in missionary countries, Father Emilio has a large parish but is also responsible for ministering to people in different outlying, rural areas. You see him here saying Mass at one of the makeshift chapels in the countryside. I’ve also been thinking of our Capuchin missionaries in Papua New Guinea, which recently experienced a very severe earthquake. I invite all of you to join me in praying for all those who have been affected by this terrible tragedy.